When comparing these platforms, the contribution of the Apple mobile platform becomes striking. Nevertheless, it’s still important to understand the role of the Mac. In years gone, the advantage of Windows was measured in multiples of Mac sales. 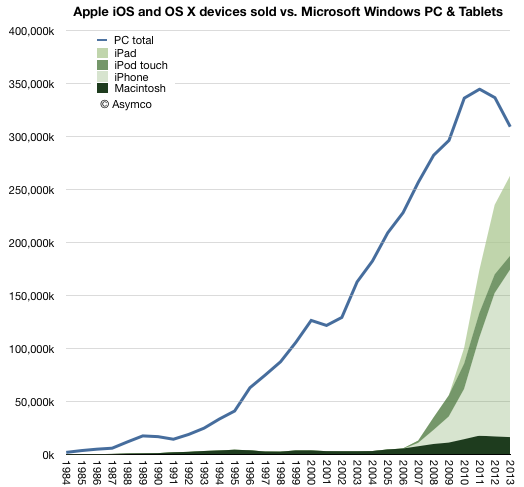 That peak occurred in 2004 when there were 56 times more PCs sold than Macs. 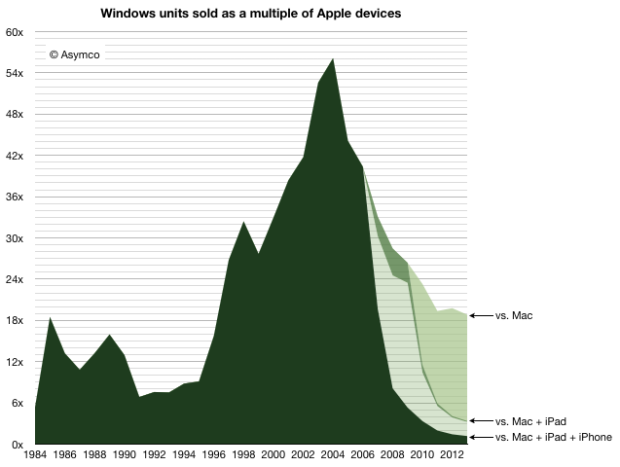 At that moment, when the Windows advantage peaked, the Mac sold 3.2 million units into a market where 182 million PCs shipped. This means the Mac had 1.7% market share. And yet, remarkably, even with 1.7% share, the Mac did not disappear. The figure of 3.2 million units was not great and below the peak to date2 but it was enough to sustain Apple while it developed its next products. At the time the iPod was starting to grow rapidly and development on iPhone/iPad was already underway. The point being that there were new products. 3.2 million was a sufficient volume to preserve the company until such time when they would be ready. Note the effect in the graph above. Even if we only consider the Mac, the Windows advantage has decreased considerably, and the platform was certainly not extinguished. The new form factor Mac Pro and the continuing improvements in the thinnest of laptops shows how Mac has not just survived but prospered as the underdog which easily captures the bulk of profits. It’s important to understand just how the quantities involved here have a quality of their own. The quantities themselves speak of a change. It’s not convincing to suggest that what comes around goes around and a reversal of fortune can be reversed yet again when there are several zeros added to the end of the figures involved. We have to understand that the Windows advantage itself came from the way computing was purchased in the period of its ascent. In the 1980s and 1990s computing platform decisions were made first by companies then by developers and later by individuals who took their cues from what standards were already established. As these decisions created network effects, the cycle repeated and the majority platform strengthened. But it was the large companies who made the core decisions. In the 1980s if the Fortune 500 companies all standardized on Windows then their suppliers and customers would also standardize on it. Add governments and other institutions and 80% of the market is probably decided. There was concentration in decision making. In other words, in the 80s a platform could win by convincing 500 individuals who had the authority (as CIOs) to impose through fiat a standard on the centers of gravity of purchasing power. The decision making process for buying computers, which began with large companies IT departments making decisions with multi-year horizons, has changed to billions of individuals making decisions with no horizons. Companies have become the laggards and individuals the early adopters of technology. The fundamental shift is therefore in the quantity of decision makers and the quality of those decisions. Those who buy are also those who use and their decisions will be perhaps whimsical, maybe impulsive and not calculated, but fundamentally, in the aggregate, wise. Ultimately, it was the removal of the intermediary between buyer and beneficiary which dissolved Microsoft’s power over the purchase decision. It’s not just unlikely that this situation will be reversed, it’s impossible. 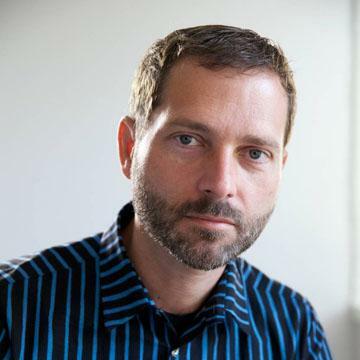 Computing decision making has moved to the furthest edge where use has been for decades. The computer has become personal not just in the sense of how it’s used but in the sense of how it’s owned.